Oliver Ressler, born 1970, lives and works in Vienna and produces installations, projects in public space, and films on issues such as economics, democracy, global warming, forms of resistance and social alternatives. 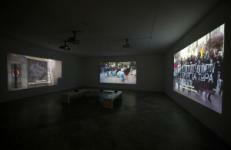 Oliver Ressler has had solo exhibitions in major art spaces such as Berkeley Art Museum, USA; Platform Garanti Contemporary Art Center, Istanbul; Museum of Contemporary Art, Belgrade; Centro Cultural Conde Duque, Madrid; Alexandria Contemporary Arts Forum, Egypt; The Cube Project Space, Taipei; Wyspa Institute of Art, Gdansk, Lentos Kunstmuseum, Linz; and Centro Andaluz de Arte Contemporaneo – CAAC, Seville. Ressler has participated in more than 250 group exhibitions, including Museo Reina Sofía, Madrid; SALT Beyoğlu, Istanbul; Yerba Buena Center for the Arts, San Francisco; Van Abbe Museum, Eindhoven; MASSMoCA, North Adams, USA and at the biennials in Prague (2005), Seville (2006), Moscow (2007), Taipei (2008), Lyon (2009), Gyumri (2012), Venice (2013), Athens (2013, 2015), and Quebec (2014). He is the director of 23 films. A retrospective of his films took place at Centre d’Art Contemporain Genève in 2013. For the Taipei Biennale 2008, Ressler curated A World Where Many Worlds Fit. A traveling show on the financial crisis, It’s the Political Economy, Stupid, co-curated with Gregory Sholette, has been presented at nine venues since 2011. In collaboration with Ines Doujak he co-curated Utopian Pulse – Flares in the Darkroom at Secession in Vienna in 2014. He received the 1st Prix Thun for Art and Ethics Award in 2016.